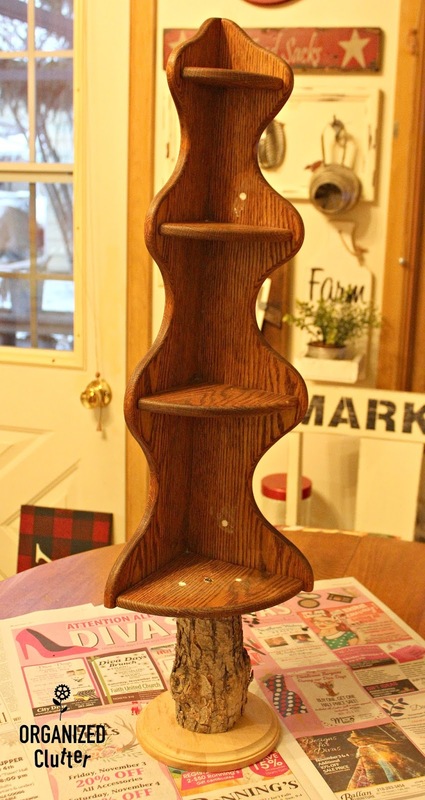 This corner shelf was one of the items in my August Thrift Shop and Garage Sale Post. My mom actually got it second hand at a sale in her apartment building. 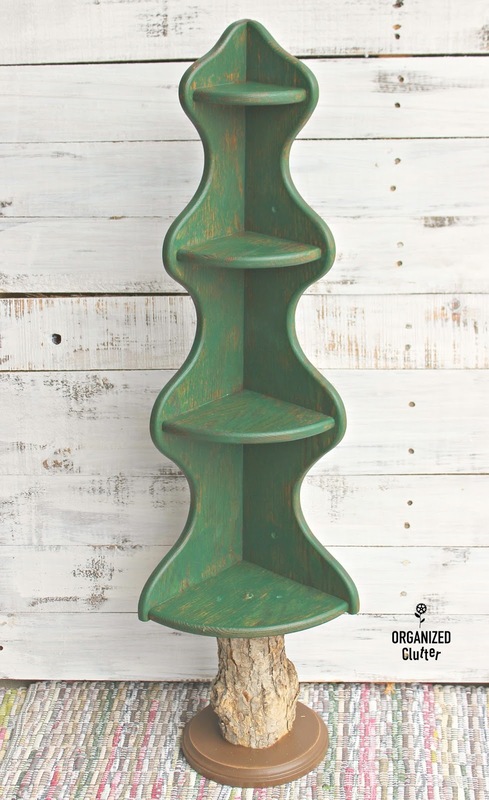 When I saw this shelf, I saw a Christmas tree. My Plan A was to cut the corner shelf flush with the bottom shelf, removing the bottom scallops. Then I was going to mount the shelf onto a wooden candlestick with screws. This didn't work. It was too tippy. Now comes my Plan B. It starts with this round wooden base from Goodwill to stabilize my shelf tree and prevent further tipping. My husband brought back a small tree trunk from our cabin. It was cut straight on the chop saw at the top and the bottom. As you can see I have two outer holes filled with spackle. These holes were originally drilled to attach the candleholder in Plan A. The trunk was attached with just the center screw, and the bottom base was attached with screw from the bottom. Start pilot holes for your screws with a drill. So here is my Christmas tree. I also had to fill two additional holes with spackle, because the shelf had once been screwed into the wall. Now to give my project a paint job. I thinned a small amount of Annie Sloan Chalk Paint in Amsterdam Green with a little water. This photo was my tree after one coat of dry brushing. And here is my tree after two coats of dry brushing and Varathane Crystal Clear Water-Based Polyurethane Satin Finish . The base was painted with Annie Sloan Chalk Paint in Honfleur. 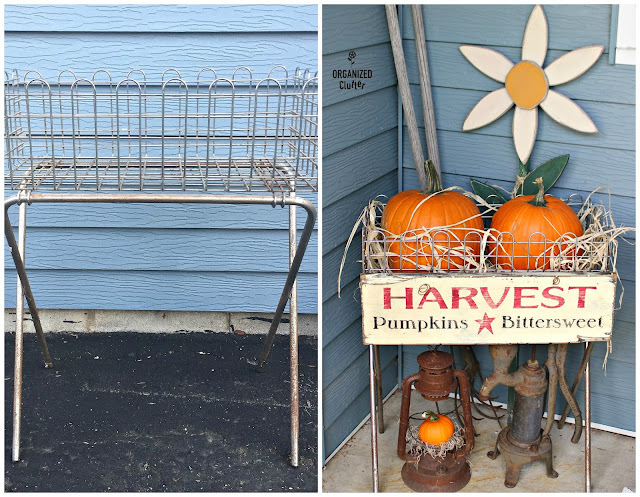 It was very fun to accessorize with rustic items like a vintage star Jello mold, an enamelware cup with faux red berry sprig, clothespins in an aluminum measuring cup with buffalo check ribbon, and a small red lantern. 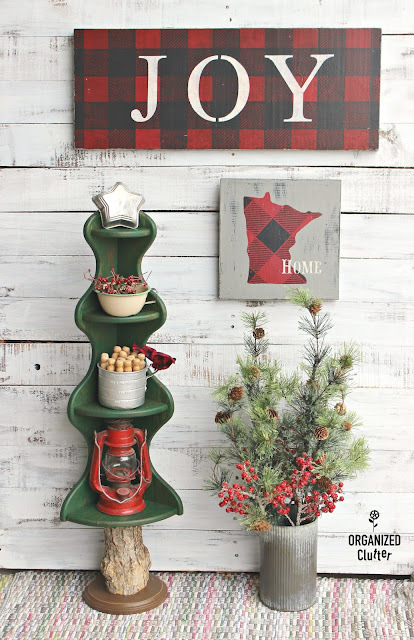 I made the Minnesota sign in the photo with 9" x 10" x 1" piece of pine board. I first base coated the board with Rust-Oleum Painters Touch Latex in Flat Black and then brushed on the topcoat with Chalked Paint in Country Gray . Next to stencil my small Minnesota sign. This is stencil pack from Artminds at Michael's. The only problem with the Minnesota stencil was that it was too small for my tray. First I stenciled Minnesota with Americana Chalky Finish Paint in Rouge . 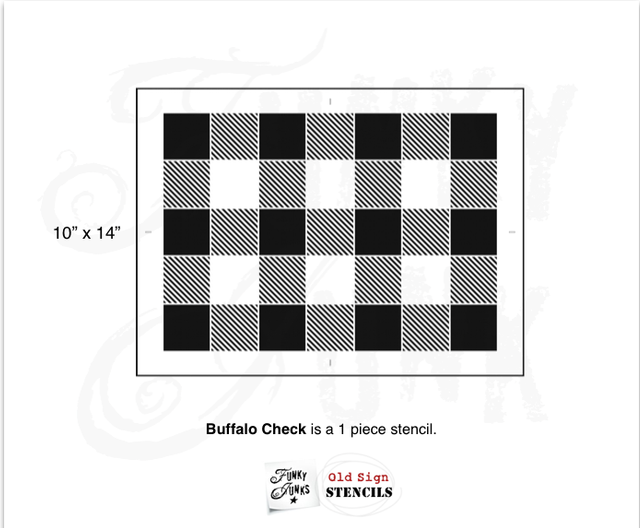 Next I laid my *Old Sign Stencils Buffalo Check stencil on top of the paper stencil and pounced on buffalo checks with Ceramcoat Acrylic Paint in Black . Funky Junk Interiors has super instructions for a layered stencil here. HOME is stenciled in Ceramcoat Butter Cream with an adhesive stencil called Happy Words from FolkArt. The sign was distressed with 150 grit sandpaper. I added a sawtooth hanger to the back of my sign, and also sealed the it with two coats of the Varathane Water Based used on the tree. Northern Minnesota is definitely a buffalo plaid area! 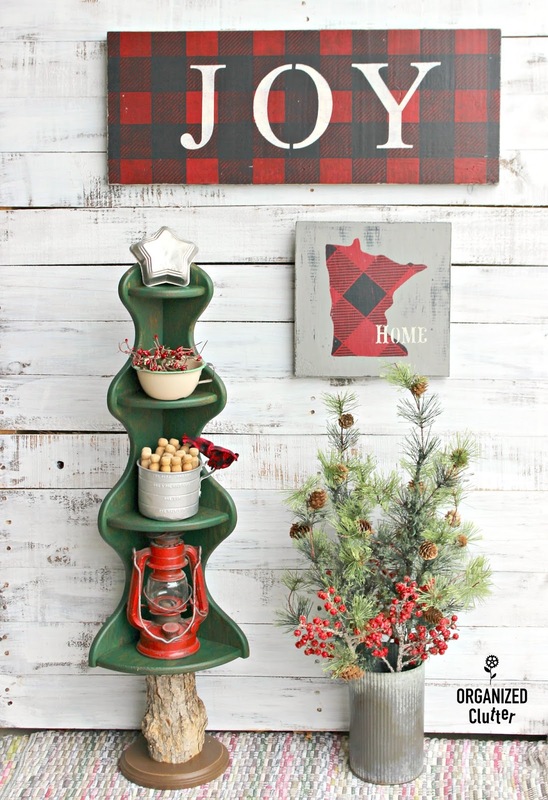 The larger JOY sign was made with a 24" x 9" x 1" pine board. It was base coated with the Rustoleum flat black latex above, and then stenciled with the America Chalky Finish Paint in Rouge above. The 5" letter stencils I used for JOY are from Show-Offs at Hobby Lobby. I sealed this sign with the Varathane water based poly and added two sawtooth hooks on the back. So cute! You really do work wonders with all you thrift shop finds!! Love this repurpose! People think I have creative ideas, but you take it to a whole new level! Love how you turned it into a Christmas tree. Very cute! Wish you could tell where to find those sorts of things here in VT. Corner shelves are not that rare at thrift shops. Thanks. That is so great! I love what you did with the shelf. So creative & works great with the holiday. How fun.....what a unique and clever tree! I love the wooden clothes pins in the tin cup! As always, thanks for sharing your clever ideas! That is really cute! I admire your vision! You are simply way too creative!!! A Christmas tree...WOW!!! I love it! That turned out so cute, Carlene...I would never have seen a tree! The whole vignette is adorable! 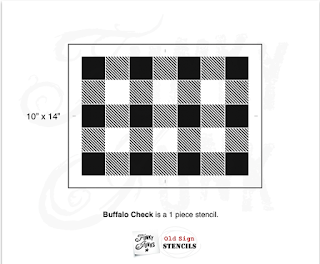 I am having so much fun with the buffalo check stencil! Thanks Linda. 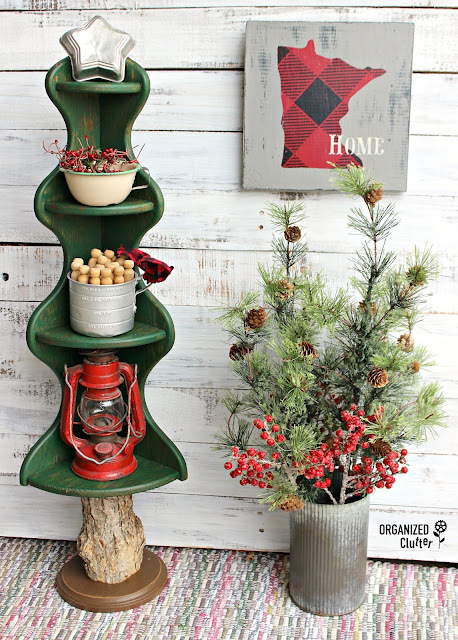 This corner shelf to tree is genius, Carlene! 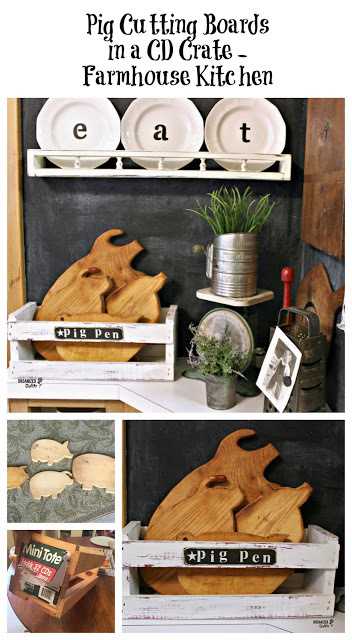 I've got a 5 foot corner shelf in the garage I want to do this with! 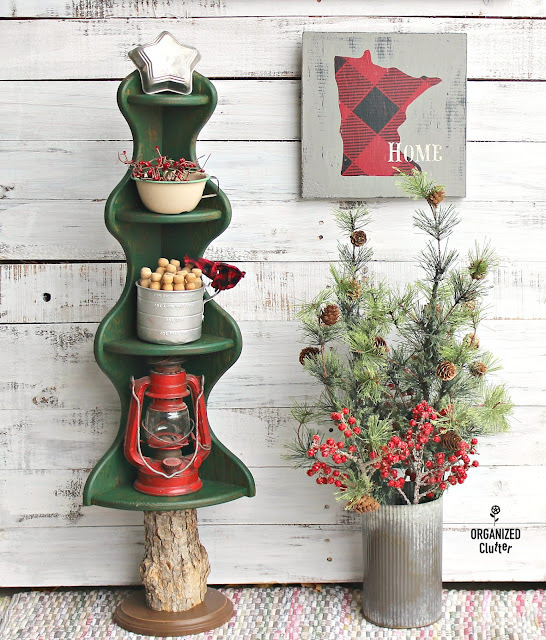 Girl, I have always thought you were clever, but I WANT to find a shelf to make a tree...just out and out stealing this idea! You really have a way with seeing the potential in everything, well done!